The Sheffield Group is the leading direct sales consulting firm having served nearly 1,000 client companies over the last 30 years. While we have worked with multiple software companies over the years, MultiSoft has demonstrated a level of professionalism for our clients that is exceptional. The company’s customer services are the best we have experienced. While not every MLM software company fits every business model, I highly suggest you give this company special attention as you do your due diligence. MultiSoft’s process of on-boarding of our mutual clients is the smoothest we have experienced in the industry as their MarketPowerPRO single source MLM Software is a “once and done” for all of our clients. We’ve had great success so far and MultiSoft has become PayQuicker’s fastest growing referral partner. With only good things to say about him and MultiSoft, we would highly recommend you look into what MultiSoft can offer your business. I have had the pleasure to work with Multisoft and grow our partnership over the last three years. They are dedicated to their customers as well as partners and do everything they can to help them be successful. From a partner’s perspective, their team has been great to work with in all aspects of sales, marketing, project management, and leadership. I look forward to the future and continued growth of our partnership. I just wanted to say that we all here at Bio Factor truly and sincerely appreciate everything you have done for us. We recognize that you have went above and beyond the service you give your clients in order to help make our dream with Bio Factor come true. When compared to the competition, MultiSoft outshines the rest. 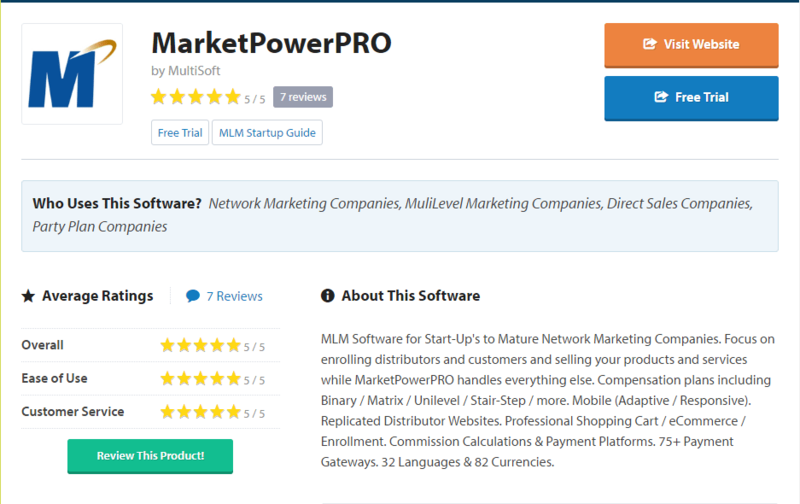 MarketPowerPRO is a dynamic, easy-to-use platform that covers all the essential checkboxes, and more. And, most important, the MultiSoft team is both responsive and helpful. I couldn’t recommend them more highly. Our companies teamed-up to enable Avalara’s services within MarketPowerPRO and MultiSoft was on top of things from start to finish: MultiSoft certainly made the job as quick, easy and thorough as possible, due to their excellent, experienced, technical resources. We are an high tech company. That is why we went with MultiSoft. What I love about their staff is that although they know way more than I do, when I call with a question, they always treat me with respect. Their support staff is the best. I have worked with Robert and MultiSoft on more than one project and have referred them to many. I have personally used them for my own company and found them to be very reliable and affordable. Their knowledge of the networking sector and software development is unparalleled in the market. Director of Business Development, Medytox Medical Marketing & Sales Inc.
As a senior direct selling company executive, I’ve worked with many of the industry software providers over the years and Multisoft is the best of the best. Their commitment to customer support is unparalleled! Great service and very helpful people! But be aware that you need to do a lot of work setting up the MLM website and you will also need to learn everything about the system, and this is kind of time consuming, but well worth your efforts. By the way, I want to congratulate Multisoft for having Jessie as a team member. He is truly an asset to your organization. He has demonstrated a caring and attentive attitude paired with substantial product knowledge and a willingness to ensure that our needs are met. Kudos to Multisoft for attracting such a quality member of your team. Co-Founder, The Original Quiz Glass, Inc.
We chose Multisoft’s Market Power Pro early as a partner and they were upfront about their model, costs, limitations, and strengths. I am very pleased we went with Market Power Pro. They helped us plan from the beginning and they have been our software partner since the beginning of our company. They are responsive to our needs and their support team works very quickly to resolve any issue we have. MultiSoft has been phenomenal in grasping our vision and what we needed with our software program. Their team has gone above and beyond in making sure that we are set up correctly, and quickly give feedback and answers to any questions that we have. Based on my experience, I would recommend MultiSoft to anyone that can utilize from their services. I have been working with Robert Proctor President of Multisoft for a couple of months now. The software is second to none. The support staff is fast ,efficient , and very informative. Our company (Child I.D. is a 21 year old established business), We are very excited to be working with the best MLM software team on the market today. We expect nothing but success and we will be working together with Robert and his staff for many years to come. Founder & President, Child ID Label Inc. I just wanted to take the time out and let all of you know how much help Jessie has been lately. I haven’t needed anyone’s help recently until now, with some of the product additions etc that we have going on we are had to reach out as of late. He has really been taking care of us and quick responses and action. I just wanted everyone to know what a great job he is doing and I am glad we get to work with him. We really appreciate it when we have people to work with like him. It is a real privilege to work with a professional and dedicated business such as Multisoft. The management and staff have worked diligently with us right from the very beginning. As with any business that is just getting off the ground there are always things that arise that were not anticipated or foreseen. Robert Proctor and his staff at Multisoft were right there the whole time offering solutions and assisting the process of working through every issue.I can’t say enough about the Market Power Pro software. It is very user friendly and easy to navigate. First I want to say thank you for all the time and work to get us up and running with our new website! That is no small project!! (And there is still more for me to do on the site to perfect it! )… I love the site- it looks great, and I look forward to years of smooth sailing with you and your team. Everyone has been SO fantastic and worked SO hard to help me make things happen, train me and find solutions to problems! I just wanted to send a quick note to say thanks again for all the support and help you have given us. The team has certainly surpassed expectations. To have issues happen on a Friday night and get them resolved on a weekend is a miracle. Amit we really appreciate you working with us to get everything handled and your ability to make what seems so complicated to us so simple. Jessie and Brandy your patience has been amazing as you walk us through all of the set up procedures. Robert by you interveneing with all the vendors to ensure proper set up and speed up the process has made the transition easier. 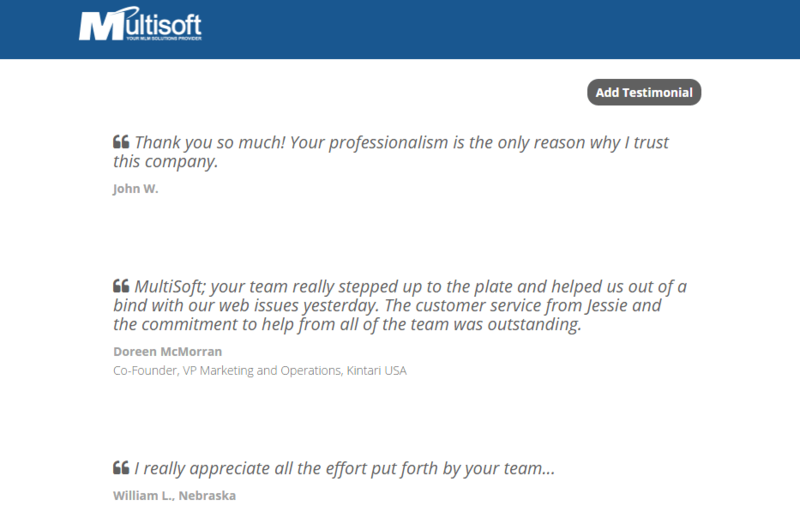 We just want to thank the Multisoft team and let you know how much you are appreciated. I was asked to give a testimony about Multisoft. I thought that’s easy it’s a great company run by great people, but then I realized it’s really about the team they have. It simply started with me reaching out to Robert the CEO of Multisoft about some pricing in regards to another software option for our company. The rest is history. He’s probably one of the best CEO’s I know. He’s out front leading the charge. Leading by example both in customer service, sales ability outpacing his own sales team. Even when hurricane Irma devastated southern Florida where Robert resides and Multisoft is headquartered, he never lost a beat. No power, internet etc. He just kept it moving while our company was in the middle of a pre-launch. Any issues we had were taken care of in a timely matter exceeding our expectations. The team is amazing! Over 30 years of experience, being worldwide in 4 countries, 5 offices, 60 plus employees with everything stored up in the cloud for security and safety. Speaking of the team. Amazing. It started with Brandy (Superstar) in regards to the compensation plan integration. Then over to Amit (Superstar) who’s over the top in every way and I swear he never sleeps. They’ve got Amanda and Jessie just to name a few who are there for product set up and integrations etc. Their customer support and help desk is incredible. It took me awhile to accept their system because I’m used to direct emails, but once I listened to Robert and started using their system everything clicked. Every request I’ve submitted has been in a timely matter. In short, I live by the principle of under promise and over deliver. Don’t meet the customer’s expectations, but rather exceed it and that’s exactly what Robert has done with his team and company Multisoft. In short to quote an old phrase: YOU GUY’S ROCK!! So much built-in flexibility enables us to do most of the things we need and want with little or no programming expense…. and their customer service is the best! It’s so robust, that we are still determining the best way to use all it’s functionality to create the best web system and customer experience…. and looking forward to some additional options for member genealogy reporting.